I've been working on a high fantasy trilogy for four years now. Book 1 in the series was the first book I ever wrote. I finished it in late 2011. By April 2013 I finished Book 2. I immediately launched into the next project, which a sci-fi novel. Last summer, as I edited Book 1, I began to wonder if I wanted to bother with Book 3. Sci-Fi was going well and I had a bunch of ideas for new High Fantasies. I also had absolutely no idea what would happen in Book 3. So when it came time for NaNoWriMo 2013, I hardly even considered writing Book 3. I hadn't revised the first draft of Book 2 since April and knew it was a stick marsh of quicksand subplots that bogged down the story and underdeveloped romances that stunk up the whole manuscript. But then, recently, the unfinished story has been bugging me. Ideas for plots and character developments have laid siege to my head. Book 3 still isn't ready to be written, but it's much closer. I have a general idea of a plot. I know that a few characters must die, and I know how a few other characters will react to these deaths. If I were more of a Pantser, I would have enough to start writing the novel. But since I'm not, the novel needs to wait a few more months. My point is that sometimes there's a novel that's not ready to be written yet. Maybe it needs to sit a year. Maybe you need to read the right writing-self-help book. Maybe you need to watch the right TV show or listen to the right song. For me, there are ideas that I'm just not ready to write. I've started writing a few of these ideas, but normally abandon them at about the Chapter 4 mark. Some of these I'm not old enough to right. For some, I just need a little more life experience. And in the mean time, I have stories that I am ready to write that I'm excited to get to work on. So scribble that novel idea down, tuck it away, and forget about it for a few months; at least long enough to finish a first draft of one novel and the second of another. But if you're feeling bad that a really great novel idea is just sitting in the dusty corner of your computer hard drive, don't. Finish whatever project you're working on and then ask yourself if you're ready to write that novel. If not, that's okay. If the characters haven't started talking to you yet, if the plot isn't twisting into an recognizable shape yet, let your idea gather some more dust and work on a story idea that's more receptive. As long as you're writing you're learning, making progress, and getting closer to being able to write that novel. What do you think? 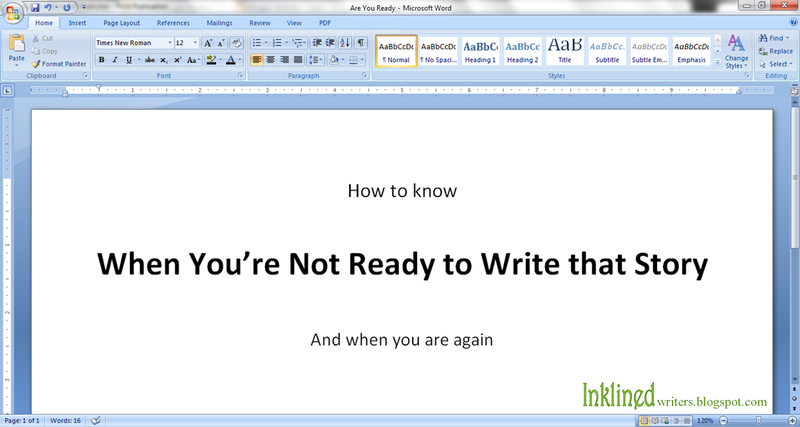 Are there stories that you're not ready to write? Or are you just procrastinating in a story because you've hit the sagging middle? Leave a comment or write up a blog post of your own to clue me in. P.S. If I'm not great at responding to comments and the like this week, I apologize. I'll be spending about 15 hours a day inside a theater for the next week as my drama troupe prepares for our first performance of the year. For me and my sister, our characters don't talk to us. It's hard to talk to my characters. But they talk to each other all the time, and I listen in and write things down. When I wrote the first draft of one of my books for Nanowrimo, I don't think it was quite ready to be written. I had the story figured out yes, but the world hadn't been completely developed yet, nor the characters. So in a sense, I was pantsing, though I had technically somewhat outlined. But now, a few years later, I've gotten a few more ideas for it, and I'm getting excited about rewriting it. So that's cool. But I still feel like the rewrite isn't ready to be done. So I'm working on my other project first. I've definitely found that I'm not ready to write particular stories, before. Sometimes plots and characters just need to stew for a little longer. :) Break a leg! Took a hiatus from my novel because it wasn't falling together, and I just needed some more research. When it fell together, I delved back into writing SO EXCITED! This is so true! I always say I've got a novel "stewing on the back burner." Every once in awhile, I'll get a new idea, and I'll throw it in the pot. And eventually it's ready to be served... and by that, I mean the Sloppy Copy is ready to be written. It certainly isn't ready to be consumed by anyone. Yeah, my analogy kind of falls apart. But, the point is, some books have to sit. I thought I was ready to write one of my books, but as soon as I started writing I felt a complete stupor of thought. Meanwhile, I had an idea for another book, and as soon as I started writing it I began making huge progress and getting more and more ideas. It's those first few chapters where you really learn if this book is ready to come into being or not. I've had this great idea for a long time and I've thought about it enough that I have a whole story in my head. I really want to write it soon, but I've noticed I can't yet. Every time I go to write it I realized I'm not ready yet. Even when I'm sure I'm ready. I don't know what it is.